A greenhouse works by keeping convective air currents within a defined area by means of a fixed (transparent) roof, there is only one thing in nature that approximates that…..clouds. 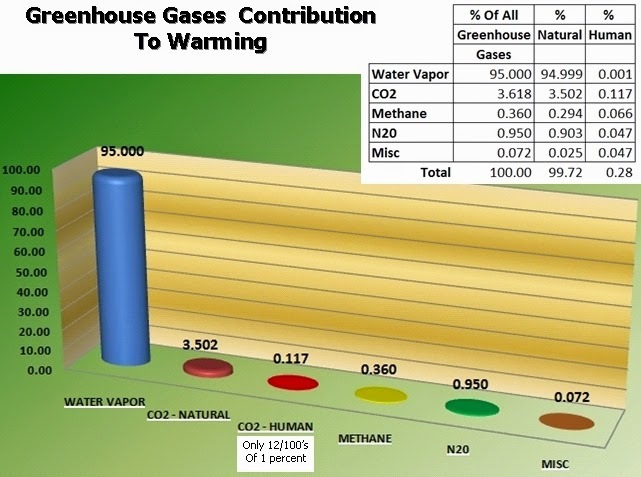 But NOT “green house gases”. Nevertheless “green house gas” has entered the language so that’s the term we’ll use. The idea that IR radiation from radiative gases in the upper atmosphere can warm Earth’s surface (the keystone of global warming by greenhouse gases) flies in the face of the laws of thermodynamics. The Main component gases of earth’s atmosphere – by volume. # Note – Water vapor varies by volume in the atmosphere from a trace to about 4%. Therefore, on average, only about 2 to 3% of the molecules in the air are water vapor molecules. The amount of water vapor in the air is small in extremely arid areas and in location where the temperatures are very low (e.g.. Polar Regions, very cold weather). In very warm and humid tropical air the volume of water vapor is about 4%.